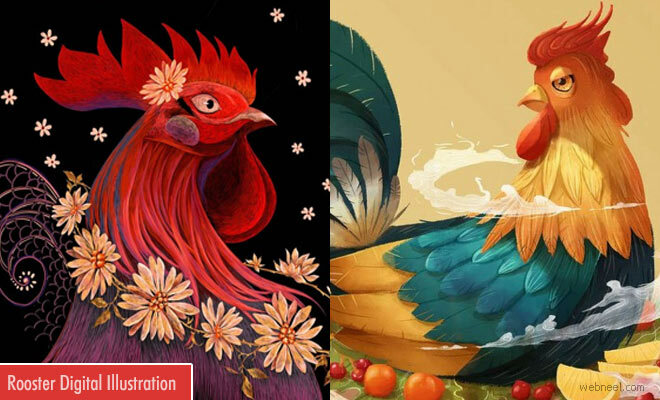 Digital Art : Lunar year 2017 is known as the year of the rooster and these vietnamese artists are welcoming their new year with awesome rooster digital illustrations. Some artists have used watercolors, adobe photoshop, illustrations in various shapes and colors. It's such a heartwarming sight to see little children reading a book, while sitting on their favourite pet. Vietnamese celebrate their new year with great pomp and show in a traditional way. The Vietnamese Lunar year is also known as the Spring Festival. It's a week long celebration with great fun and entertainment. This year the Vietnamese Lunar year 2017 was on January 28th, 2017. If you have missed the celebration, you can enjoy these rooster digital illustrations created which was created with great love and care.